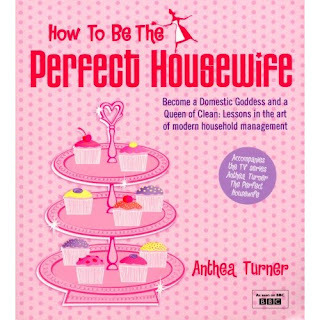 Being quite the fan of Anthea Turner's "How to be The Perfect Housewife" series, the book tie-in was one which I looked forward to reading. Or devouring, as it turned out. Now before I go any further, let me explain one thing: I am by no means a perfect housewife. Cleaning is not a task which comes naturally to me. I am perfectly happy to live in a home resembling ordered chaos and can think of a million more interesting things to do than laundry, ironing and spring cleaning! I chose to buy this book (as a gift to myself, nonetheless) because I wanted a book which would help me learn to take care of our home more efficiently, leaving me more time to spend on the million more interesting things I could think of than ironing a huge pile of my husbands shirts. After a few moments examining the contents in the bookshop, it seemed quite apparent that this would be a suitable book for my needs. How to Be The Perfect Housewife is organized into 19 chapters, each of which deals in a particular "lesson" of household management. These chapters so follow in the order you would expect to learn about the management of your home, beginning with "Decluttering" (as Anthea explains, this is the first step towards a clean and tidy home), through to "Cleaning Room By Room" (chapters 3 and 4); "Kitchen Sense" (chapters 12 and 13) and "Home Safety" (chapter 19). Anthea's approach is ideal for those who seek a solution for organizing and managing their house, no matter what their circumstances or income. In my opinion, the choice and ordering of these chapters aids in educating the reader in the manner you would expect to learn in a classroom or long-distance course. Essentially, I believe these lessons reflect the learning curve she creates for participants of the TV show (though I would love to get my hands on one of those manuals she presents to each wife as a "crash course" in housewifery!). Each chapter is broken down into small chunks which make the lessons very easy to digest. Rather than write long (boring) paragraphs, Anthea presents her ideas in short paragraphs, bullet points and lists, enabling the reader to literally dip in at any point in the text. Important tips are highlighted in their own boxes or sections, while each page is somehow decorated with quirky (and mostly feminine) icons which I find makes light of the ardous tasks discussed in the text. Indeed, this appears to be an extention of Anthea's suggestions that housework could be made enjoyable. In the same way we are encouraged to decant cleaning solutions into pretty bottles to brighten up our maids cupboards, her prose is presented alongside pretty flowers and flirty decorations. After watching almost every episode of the TV series, I'd hoped to find at least a good scattering of Anthea's recipes for cleaning products, tricks for folding T-shirts and towels, and lists of daily/weekly/monthly chores. Sadly, these expert tips were few and far between in The Perfect Housewife. While there is a recipe for Anthea's ultimate grime-busting solution (which uses only natural ingredients) and a section on creating a cleaning schedule for your home, I couldn't help feeling a little disappointed that the television series revealed far more interesting tips than were offered in the book. I must admit that Anthea Turner is a woman I would love to hate: like Mary Poppins, she is practically perfect in every way. Her home is a dream house; her cupboards immaculately organized and her souffles always rise. As in the television series, you may well find her lessons of the home come across as rather bossy and unquestionable, yet for me this is the beauty of her advice: when you put these ideas into practice, you can honestly attest that she is right! So much as I would love to hate Anthea, the fact is I simply cannot. She is - as the cover describes - "The Queen of Clean". She knows exactly how to manage a home, and considering her mansion has two huge kitchens and a menagerie of pets, the management of her own household is testament to her expertise. A beautiful cosy home has very little to do with money or size, but has everything to do with making the best of what you have. Be sure to read through the introduction to learn about the family in Delhi who made her feel such a welcome guest. For me, this story is the perfect example of what Anthea hopes we can achieve by following her advice. Overall, The Perfect Housewife is a very useful book for those who need a kick-start in the right direction, or who seek inspirational advice from the self-confessed "Queen of Clean". It's not aimed at those who do actually aspire to be perfect, but instead those who feel they need a helping hand, a little guidance, or a chapter full of useful tricks for removing every stain your family could possibly throw at you. So if you feel your own home could use a little TLC, or that your organizational skills could use some touching up, be sure to look out for The Perfect Housewife at your local bookstore. How to be The Perfect Housewife is currently available from Amazon, priced at £9.09.